In GeoCue 2017 we added the ability for GeoCue to write the Classification Lookup VLR as provided for by the LAS v1.4 specification. The Classification Lookup VLR is an optional VLR that can be used to convey to non-ASPRS standard classes or user-defined classes when passing around LAS files. 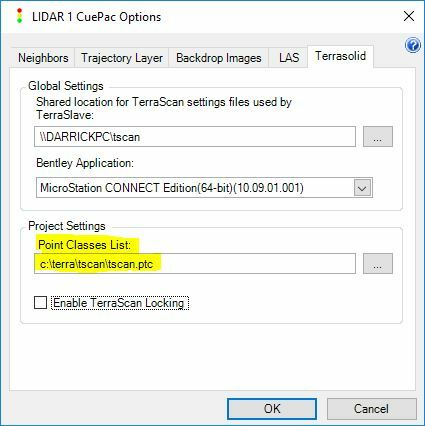 GeoCue will write this VLR into LAS files it writes whenever the Terrasolid Point Classes List (GeoCue Client -> Setup -> Options -> LIDAR 1 CuePac -> Terrasolid – Project Settings -> Point Classes List:) is not set to the default, “c:\terra\tscan\tscan.ptc”. Conversely, GeoCue does not write the Classification Lookup VLR when the default tscan.ptc file is set since by default that point classes list only contains standard ASPRS classes defined in the LAS specification.